One problem faced by a profit center loyalty reward program firm is that of determining the percentage of the points (the so called "breakage factor or "breakage rate" in loyalty programs industry) accumulated each year that end up not ever being redeemed by members, and that should therefore, be recognized as revenue in the establishment of the periodical financial statements. A higher breakage rate will contribute to increase the net income and profitability on the financial statements. This in turn would offer a competitive advantage to a firm in attracting and pricing new third party partners, developing company strategic plans, and managing the overall yearly reward capacity. In this paper, we propose a quantitative methodology for determining the breakage rate in Loyalty Reward Programs (LRP). The proposed methodology is a simulation-based approach in which the accumulation and redemption of "points" is modeled as a stochastic process. An application of the approach to a real-life context is discussed. Nsakanda, A. (2007). 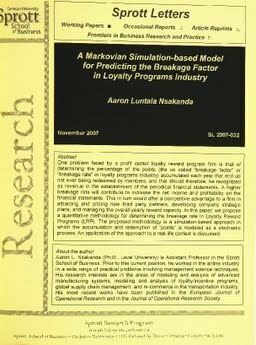 A Markovian Simulation-based Model for Predicting the Breakage Factor in Loyalty Programs Industry. Sprott Letters, November(2007).